">:)JOIN OR ELSE POLAND WILL LIKE TOTALY APPLY THE POLAND RULE ON YOU >:)"
Login or register to add hetalia-fan-club!! as your friend! Ooo, a Hetalia fan club. Hnnn, lets see.. 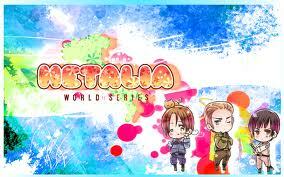 I love Hetalia.. I think Italy is absolutely ADORABLE.. I would love to be a member! !~ If thats alright. Also, England is my favorite country in Hetalia. Oh hi to everybody! I wanna join, but I dunno how to do it! HI im well ... i dunno anymore but do you give members who join out, lets to go and join back in?? it's funny how i'm on here & watching AP:H at the same time!!! :P :) ;)!! !